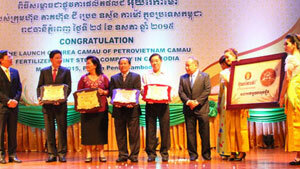 Addressing the event, Cambodian Deputy Prime Minister Men Som On highly praised the presence of Vietnam’s fertilizers on the market, saying that it will provide a good chance for Cambodian farmers to choose high quality products at reasonable prices. The Company General Director Bui Minh Tien revealed that the Ca Mau Fertiliser Plant, with an annual capacity of 800,000 tonnes of urea, is able to meet both domestic and export demands. The company will develop a network of sales agents and distributors and set up a representative office in Cambodia right after this ceremony, Tien said. He added the company has entered into four contracts with its Cambodian partners and planted a trade representative in the country for products promotion and distribution.